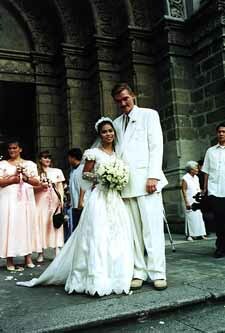 Chad and Vivian got married on June 27th, 1999 at the Manila Cathedral in Manila, Philippines. 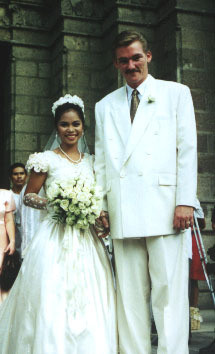 It was a lovely traditional Catholic wedding. 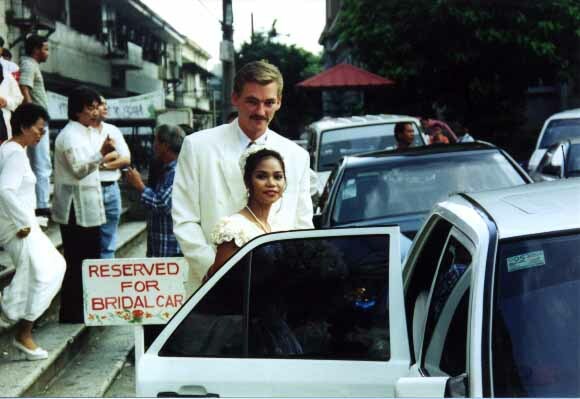 Chad and Vivian had both family and friends present to wish them well. 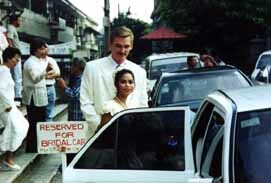 Chad meet Vivian while he was working in the Philippines for Siliconix. 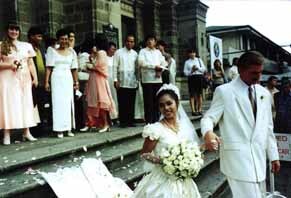 They meet at Sam's Pizza in Olongapo, which is about 4 hours north of Manila, just outside Subic Bay Freeport Zone, an ex U.S. Navy base. I think he just looked over and it was love at first sight. Vivian was more interested in her pizza though, and took a while to come around. Chad is now living back in the U.S, in Sacramento, California. He is planning on bringing Vivian back with him as soon as she finishes her masters in chemical engineering. I think he better get a job with the airlines so he can get cheap/free tickets back to the Philippines. Vivian is very close to her family, and I am sure she will want to go back and visit on a regular basis. 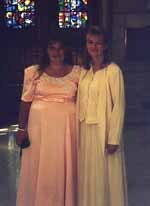 Vivian's beautiful dress was made by Vivian's wonderful mom. The Manila Cathedral is the oldest church church in Manila. 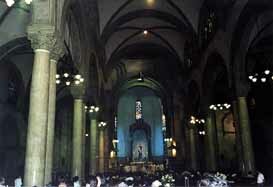 It is very large, and has a lot of architectural detail. I don't have pictures of the outside, but the inside looks like this. 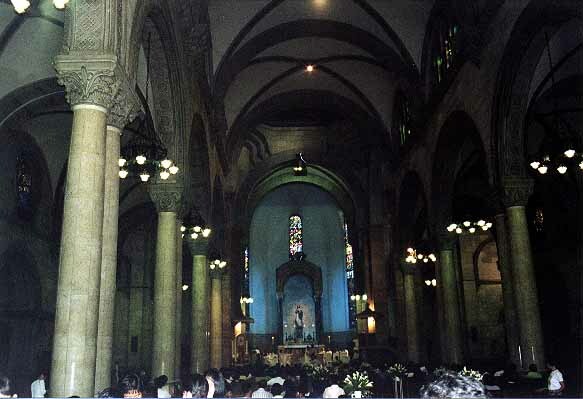 Chad and Vivian sat on a stool in the center right in front of the priest. 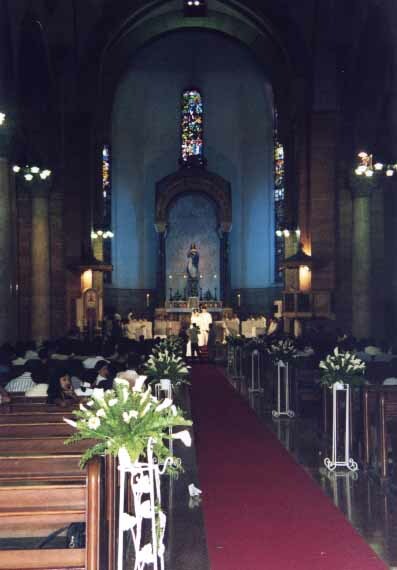 The Priest gave a quick mass, and then married them. The best part was when Chad and Vivian had to kneel during the mass. Chad was wearing new shoes, and did not notice the stickers on the bottom of the shoes. I (Shane, Chad's brother) wish I had a picture of that, but being in the wedding, I couldn't carry around my camera with me. 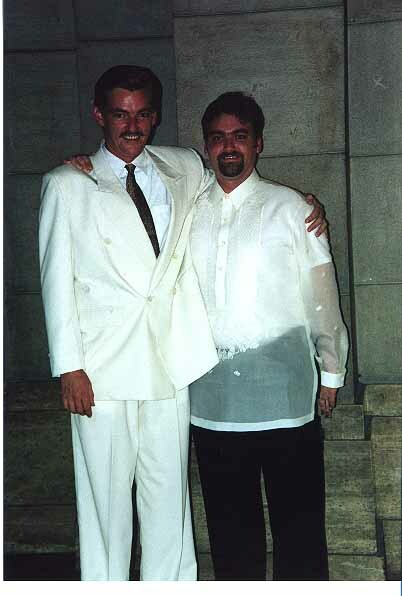 I was the best man and I was expecting to stand up next to Chad, like he did at my wedding. Actually all I did was walk down the isle first, and take my seat. Not what I expected, but easy. Later I was told I was also supposed to look important. 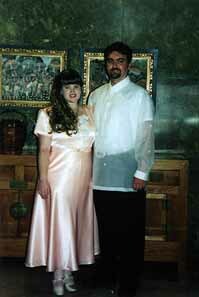 Here I am trying to look important with my wife Katie, and Chad. She is wearing a dress made my Vivian's mom. 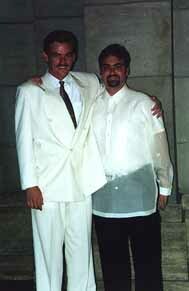 In my barong, Vivian said I looked very stately, like a senator. I'm not sure if she means I look important, like a senater, or that I look like a crook, like a senator. Katies dress fit her very well. 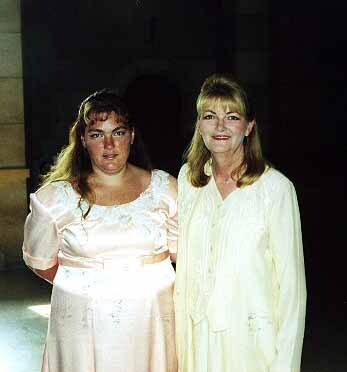 This is an even more impressive feat, when you take into account that Vivians mom only meet Katie two days before the wedding and had already made the dress. She made it from measurements Katie sent her. And Katie is also pregnant, which means her size is consistantly changing. Tiffany, my sister, also had her dress made my Vivians mom. Here is her and my mom.